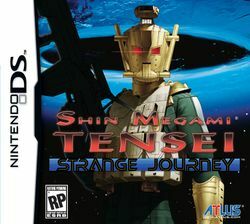 Shin Megami Tensei: Strange Journey is the next title in the Shin Megami Tensei series, and the first in the main series to be developed for a hand-held system (the Nintendo DS). The game engine is based on the engine used for the Etrian Odyssey series of games. The game features first-person dungeon crawling and early screenshots show battle scenes similar to Shin Megami Tensei: Devil Survivor, but with animated enemies. A large distortion appears at the South Pole. Reported as a "ferro-magnetic blizzard", it is in fact a plasma wall of unknown origin which destroys everything that comes into contact with it, and it is slowly expanding. Dubbed the "Schwarzwelt" by the scientists studying it, the few probes that manage to get through send back bizarre, surreal images. Four "ships" - vehicles capable of travel by land, sea, and air - are sent; the Red Sprite, the Blue Jet, the Elve, and the Gigantic, are sent to investigate under orders of the United Nations. All are crewed by the best soldiers and scientists and equipped with the latest technology every nation on the Earth can provide. Their mission: find out what is causing the Schwarzwelt, and put an end to it before it endangers all life on Earth. This page was last edited on 18 May 2018, at 21:32.